Ages 9 through 13. Use the curriculum-based language development activities in this book to help children with language and learning difficulties improve vocabulary, sequencing, and other important language skills. Activities from science, math, social studies, and language arts are used to build language competencies. Exploring relationships between animals and their environments, working with weather words, and organizing facts presented in social studies activities are among the skills emphasized. 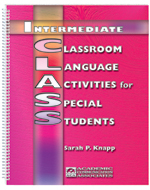 This book is organized into four sections (Math, Social Studies, Science, and Language Arts). The sections are divided into 12 units and the units include a total of 29 lessons. When working with students who have language disorders, the lessons may be supplemented by teacher-made activities that focus on specific language skills. When teaching students about the solar system, for example, concepts relating to the size of the planets, distances between the planets, and other concepts can be emphasized. Math activities can be used to help children make comparisons and solve problems as they learn concepts that are critical for success in the curriculum.